Like most large internet platforms, YouTube is home to any number of strange, esoteric subcultures whose ways might seem incomprehensible to newcomers or outsiders. Writer Kelli McDonald explores just such an eccentric group in a piece for The Daily Dot called “Inside YouTube’s Neon Hive Of Vegas Slot Machine Videos.” As McDonald discovered, there is a thriving community built around videos of people playing slots, usually in Las Vegas. Many YouTubers are posting smartphone-shot videos of game play, the article reveals, and many more are apparently content with watching others play. It’s not so unusual, McDonald points out, when one considers that YouTube’s single most-popular figure, PewDiePie, has built an empire around videos of himself playing video games. And today’s flashy, noisy, fully computerized slot machines are actually video games, the mechanical “one-armed bandits” a thing of the past. 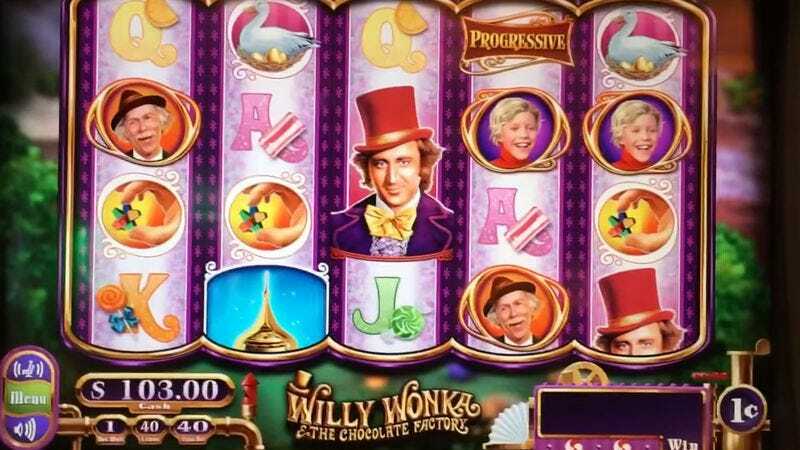 Many modern machines even have pop-culture themes, like this one based on Willy Wonka And The Chocolate Factory. Others are based on pop stars (Elvis Presley, Britney Spears) and TV shows (Wheel Of Fortune). For this story, McDonald spoke with some of the most prominent figures of this particular YouTube subgenre. Refreshingly, none seem to be gambling addicts or professional gamers who try to make a living from this. Instead, they’re just people who love the excitement of casinos and have made that passion a component of their lives. In a way, the slot community is both attention-grabbing and clandestine. A few of the YouTubers here allow their faces and voices to be recorded along with the game play, though the mesmerizing machines themselves are always the real focus of the videos. One user, SDGuy1234, is even famously vocal. (“It’s not a library,” he says.) But even so, these slot jockeys usually don’t want their real names or locations to be disclosed to the public. All seem aware of how slot machines, Las Vegas, and gambling are generally perceived in society. Maybe YouTube can change that.